It's a quiet weekend as we enter into February, with just one new wide release making its way in, and our Oscar nominees still being a lot of the story. The Winchester Mystery House is a real building in San Jose, California, built by the widow of the founder of the Winchester Repeating Firearms company, renowned for its enormous size (over 500 rooms), its extremely unusual architecture, and its numerous interior mazes, blind doors and staircases and interior windows lead to an unsettling effect. This was all done, it's said, in order to confuse all the victims of Winchester rifles and assuage Mrs. Winchester's guilt and superstitions over her incredible wealth. The lone new wide film of this week, Winchester takes on the myth and legend of this house and the spirits that might roam its halls. 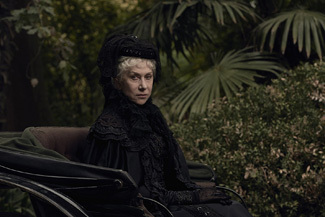 Helen Mirren slums it a bit as the lead of the film, playing the Winchester heiress, with Jason Clarke as a doctor called in to take care of her and investigate the house, and Sarah Snook as her niece. Directed by the Spierig Brothers of Daybreakers fame, it appears to be mostly a series of jump scares in betwixt a bunch of spooooky atmospheric settings. Gothic horror that just happens to be set in America, it's also not been screened for critics, so leaves one to wonder just how bad this film could be. The most closely scans with The Woman in Black and The Others, a couple of other spooky haunted house stories, but without critical support, Winchester will find itself in some difficulty to break through. Trading off a real thing while not establishing that in the pop culture well first will also prove to under serve the movie, as it's really only a bit of a fringe object in pop culture. Mirren I think also works a bit against the film, as horror fans are likely not quite ready to think of her as a viable lead to care about. I'd expect a weekend of about $15 million here. This should put it a little ahead of the second weekend of The Maze Runner: Death Cure, which opened to an underwhelming $24 million to close out the series' run. After finally dethroning Jumanji, it should fall quite steeply to around $11 million, and stumble home to about $65 million domestically, as the YA novel adaptation craze starts to hit bottom. Never tremendously popular but for, let's say, two big exceptions, this has not turned into the cash cow that Hollywood might have been hoping for. Extreme popularity is needed to actually break one of these series through and see it reach the end profitably. So, the door is actually somewhat open for Jumanji again, although I'm not counting on that to happen. It had its best hold to date outside of Christmas last weekend, with less than 20% of its business falling away. It's now the third highest grossing film of all time domestically for Sony, behind the first two Spider-Man films, and within waving distance of $1 billion internationally. This is a pretty unmitigated success for a franchise no one was really thinking about prior to last fall. I'd expect this to come in with about $11 million as well, and with a chance to be the film on the spot if Winchester fails entirely. Meanwhile, the real legs story belongs to The Greatest Showman, which still, still is above its opening weekend a month and a bit past its release date. It's continually dropping in these tiny amounts and is outperforming Titanic on a relative basis, which is not a thing you'd expect to be saying. In raw dollars, it's running out of time but a final figure of close to $200 million isn't impossible, which is, again, not a thing anyone was considering at its release. This just isn't supposed to happen anymore. It should add about $8 million this weekend. Among Oscar contenders, The Post was the best performing, with a little under $9 million, though that was already in wide release prior to the announcements. It should bring in about $7 million this weekend, and has shown that overtly political films still have an audience these days. The Shape of Water and I, Tonya continue their expansions and should earn about $5 and $4 million each, with Three Billboards staying in with about $3 million.